After a class ends, you can have staff enter workout results for your students through the Faceboard if you prefer not to have your students do this for themselves. The Faceboard uses a visually driven interface and can be used on either a touchscreen device or on a computer with a mouse. Click here to learn more about using Faceboard. 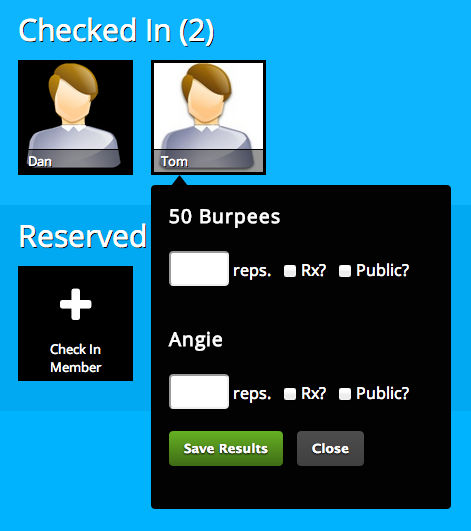 Staff can tap or click on a student's profile icon in the Checked In row then enter the results in the popup menu. The Rx? box should be checked if the student did the workout prescribed and the Public? box should be checked if the results will be posted to the public leaderboard.